This is the NEW list of all currently available graphics cards that are DirectX 12 and DirectX 11 capable, along with links to product details for each, courtesy of Amazon. Revision 20 of this list is current as of November 2015. The list contains GPUs that span every possible price point from $30 entry level cards to the highest-end gaming card available at over $1000. DX11 was available starting on on Windows 7 or Windows Vista SP 2. DX12 is available starting on Windows 10 only. Solid Tip: If you came here looking for DirectX 12 on a Fermi-based Nvidia card, I have bad news. How do I see if my card supports DirectX 12 or DirectX11? In Windows, open the search/start bar and type dxdiag, then select it from the results. The window that pops up shows you your DirectX version. 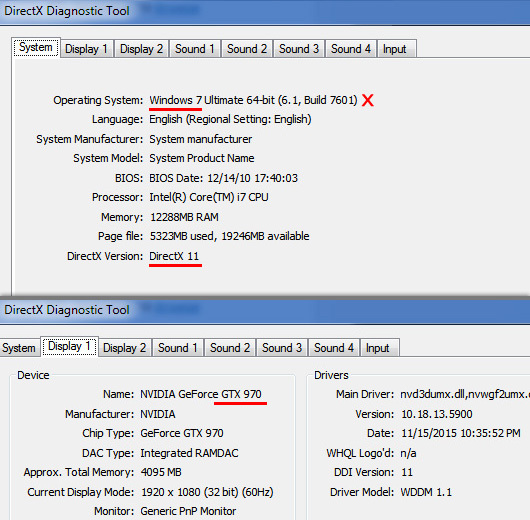 Note that this new GTX 970 shows DirectX 11, and not 12, because this system is on Windows 7. Want professional Workstation Cards? We have a DX11 list (DX12 list in the works). See the full list of DX11 workstation cards. I need a graphics card thats directX 11 compatible, for autocad which only uses directX 11. Can u help me choose a graphics card either from nvidia or amd that would suit. Hi Walter, all the cards featured here and all cards sold today support DirectX11, even the cheapest. However, I believe you will want to check out the workstation cards and be sure to have a lot of video RAM. So just to clarify if a card like AMD R5 M335 4Gb DDR3, is direct X12, then it is also direct x 11 compatible, even if it doesn’t say so in the spec. Nvidia Ge Force 965M card which is directx12, compatible with the direct x 11 graphics card. which in reality it doesn’t! Idk why nvidia does this! I have directx 12 how do I go back to directx 11.1? my mainboard supports dx 11 so may i have problem with 11.2 version of dx? and whats ur best offer for me to buy a vga? Mainboard doesn’t have anything to do with DX (DirectX), only the graphics card. DirectX 12 is on Windows 10 only. Your mainboard supports any graphics card with PCIe 2 or PCIe 3, so yes that card would work fine.